China is a growth market for JLR, Tata CEO Carl-Peter Forster says. LONDON (Bloomberg) -- Tata Motors plans to build Jaguar cars and Land Rover SUVs in China as it seeks to cut costs and expand sales of the luxury brands in emerging markets. 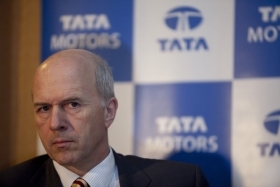 Tata will start Chinese manufacturing with Land Rover models and both brands would eventually produce as many as 40,000 vehicles combined, CEO Carl-Peter Forster said Friday at a press conference in London, declining to specify a target date. The company's Jaguar Land Rover division will be taking on luxury-vehicle manufacturers such as BMW AG and Daimler AG as disposable incomes rise in China, the world's fastest-growing major economy. The country accounted for 8 percent of Jaguar Land Rover's 208,197 deliveries in the 12 months through March, according to Tata Motors' Web site. Tata bought Jaguar and Land Rover in 2008 from Ford Motor Co. for $2.5 billion. The Indian company, including the newly combined U.K. luxury-vehicle division, returned to annual profit in the last fiscal year as truck and bus sales rose in its home country and Jaguar Land Rover reduced its workforce and scaled back spending to achieve a pretax profit. Jaguar Land Rover is targeting growth in emerging markets by opening more showrooms in India and setting up a sales company in China, where its full-year deliveries doubled from 8,821 in a 10-month transitional period ended March 2009. Setting up production in China would take one to two years after the company made any decision on partners and a location, Forster said. The division will decide by “mid-year” on which of two plants in England will remain open as the company consolidates production, Forster said. The factories are in Castle Bromwich, where the Jaguar XJ and XK cars are made, and Solihull, where Land Rover SUVs are built.